The Irish Tanaiste has stressed the controversial Irish backstop would only ever be temporary if the UK agrees a Brexit deal with the EU as he outlined plans for how cross-border services would work in a no-deal Brexit. 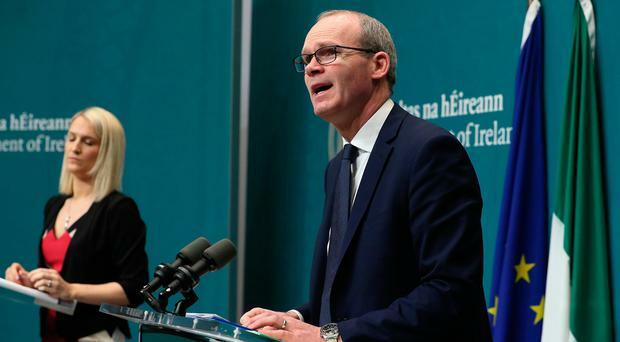 Simon Coveney was speaking as the Irish Government published their Brexit contingency plans to manage a potential no-deal. The Omnibus Bill, which will be fast-tracked through the Oireachtas parliament in Dublin, covers a wide range of governmental functions, and is designed to support businesses and jobs and secure ongoing access to essential services and products. It includes legislation covering several cross-border areas of co-operation between Northern Ireland and the Republic. These include the security of the all-island electricity market and ensuring those in Northern Ireland can access healthcare in the Republic and vice-versa. The bill also includes protections for UK students studying in the Republic by ensuring eligibility for financial support grants after Brexit. As the European Arrest Warrant system will not apply to Northern Ireland after Brexit, the Omnibus Bill includes arrangements to maintain the legal extradition of citizens between the UK and the Republic. Mr Coveney said that a no-deal Brexit would be a "lose, lose, lose" situation for Ireland, Britain and the EU. In relation to the new legislation he said: "We cannot offset all of the damage that it will do but we are doing everything we can". Mr Coveney also said: "I don't believe a no-deal will happen but we have to plan for it just in case." Mr Coveney said the backstop will not be renegotiated or abandoned, but it would not be permanent if it is enacted. "I cannot say it any louder and clearer to our friends and colleagues in London, the backstop is a result of a fair negotiation between the EU and the UK," he said. "It was designed by the UK and the EU together to protect peace on our island and it will not be jettisoned by the EU at the last minute. The EU could not be any clearer on this issue. "The backstop is fiercely supported by the people it is designed to protect. "If the backstop was ever used, it would be temporary, we don't want it to be permanent - we never have. The backstop would only apply unless or until alternative solutions can be found. "We want a close future trade deal with the UK for future generations to come for so many obvious reasons."